If color TV had come before monochrome TV, the system would be far simpler than it actually is now. Since only the three additive primary colors (red, blue and green) need be indicated for all colors to be reproduced, one visualizes three channels, similar to the video channel in monochrome, transmitted and received. One further visualizes FDM rather than three separate transmissions, with signals corresponding to the three hues side by side in the one channel. Regrettably, Color TV Transmission and Reception does not work that way. If it did, it would not be compatible. However, there is nothing to prevent a nonbroadcast Color TV Transmission and Reception, such as closed-circuit TV, from working this way. Color television must have two-way compatibility with monochrome television. Either system must be able to handle the other. Color TV Transmission and Reception must be reproducible in black and white on a monochrome receiver, just as a color receiver must be capable of displaying monochrome TV in black and white. The day all mono­chrome transmissions are superseded, which has already arrived in the industrialised countries, it will still not be possible to simplify transmission systems, because too many sets are already using the existing ones. Equation (17-1) in fact gives the proportions of the three primary colors in the luminance transmission of an NTSC color TV transmitter. Note that it refers to the proportions, not absolute values. That is to say, if Y, as given by Equation (17-1), has an amplitude that corresponds to 12.5 percent modulation of the carrier, the receiver will reproduce white. If the amplitude of the Y video voltage yields 67.5 percent modulation, a black image results. Any value in between gives varying shades of gray. I stands for “in phase,” and Q for “quadrature phase.” Both terms are related to the manner of transmission. 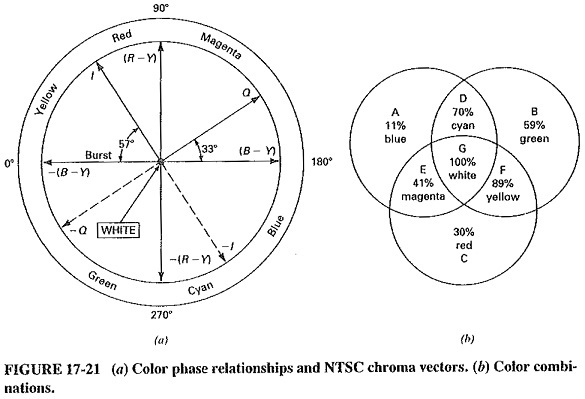 Figure 17-20 shows how the Y, I and Q signals are generated, and Figure 17-21a is a color disk (in monochrome!) showing how the various signals and colors are interrelated. The color disk shows that if the received Q signal is instantaneously zero and I is maximum, a saturated reddish-orange will he reproduced at that instant. Had I been less than maximum, a paler (i.e., less saturated), color of the same reddish-orange would have been reproduced. To take another exam­ple, consider I = 0 and Q = negative maximum. The resulting color is a saturated yellowish-green. Most colors are in fact obtainable from vector addition. It may be checked by vector addition on the color disk that 0.8Q — 0.6I yields saturated, almost pure blue. 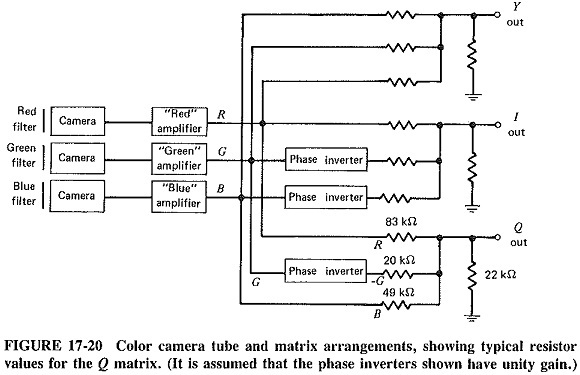 Various combinations of the transmitted I and Q signals may be sent to represent whatever color is desired (see Figure 17-21 b). In addition to showing the phase relations of the I and Q signals of either polarity, the color disk also indicates three other vectors. The first of these is the color burst, which, as the name suggests, is a short burst of color subcarrier. It is sent once each horizontal line and is used in the receiver as a phase reference. This is required to ensure that the absolute phase of the I and Q vectors is correct. If it were not sent and a spurious +90° phase shift of the color subcarrier in the receiver occurred, I would be mistaken for Q, and Q for —1. The resulting reproduced colors would have the correct relationship to each other, but they would be absolutely wrong. The (R — Y) and (B — Y) vectors are not transmitted but are often used in the receiver.